Conservative candidate Matthew Hancock signed the pledge on Wednesday - but to support victims of an insurance crash. Mr Hancock, the candidate for West Suffolk, which includes Haverhill, pledged to stand up for the victims of Equitable Life if he is elected. 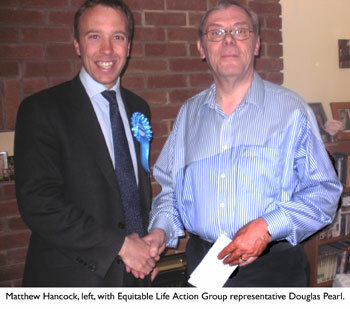 He visited Douglas Pearl, a representative responsible for co-ordinating the responses for the Equitable Life Action Group EMAG, at his home in Honeysuckle Close, Haverhill, to sign the pledge. The document says: "I pledge to the voters of West Suffolk that if I am elected to Parliament at the next general election: I will support and vote for proper compensation for victims of the Equitable Life scandal; I will support and vote to set up a swift, simple, transparent and fair payment scheme - independent of government - as recommended by the parliamentary ombudsman." Mr Hancock said: "After years of denial and delay, I am delighted that, if elected, the Conservatives will bring justice to the many Equitable Life policy-holders who lost out due to the maladministration of the Government. "Across West Suffolk I have met many people who have been hit hard by the Equitable Life fiasco. I am signing the pledge that says that I will fight for justice."